The problem with browsing the Internet is that just about every site seems to require a different password. They say that we shouldn’t use the same password for every site, but it’s tempting. Worse, when we forget our password, we request a reminder by email, so if anyone hacks our email account or can gain access to our email client, then it’s very easy for them to see the password or reminder. Result? If you use a similar password across the Internet, many of your accounts suddenly become vulnerable. One person recently told me that they use a combination of two words, consisting of the website name, their usual password, plus two numbers. This could work, as long as the website name is fairly familiar and your password follows a consistent trend (so you can remember them, easily). The other alternative is to use a central password manager that enables you to store all your web passwords, then use one key important password to access the entire database. When you surf the Internet and a site requires your user/pass, all you need to do is log in to the central password manager and it should fill the form information automatically. 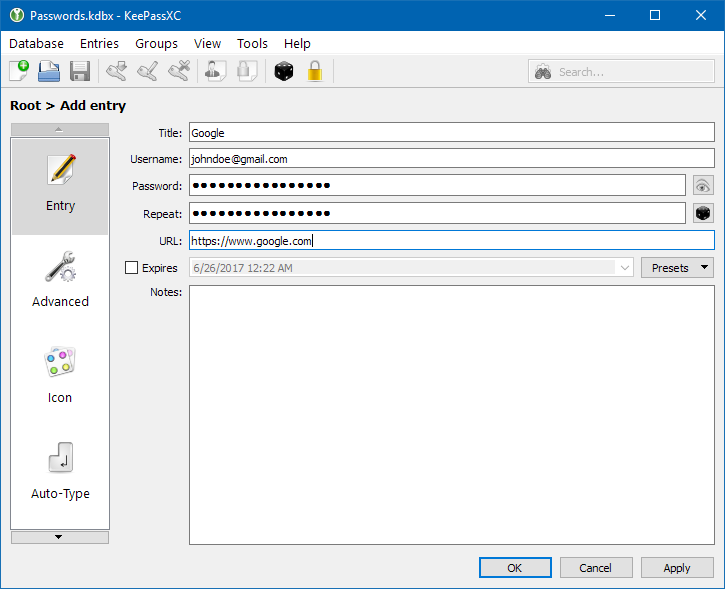 KeePass is free and one of the best central password managers. As well as storing your regular web passwords, you could use it to store a digital record of your credit card numbers and other information you use across the Internet. With ultra-strong encryption, there’s no way any hacker will be able to hack in and access your KeePass database, either. KeePassXC is the "Community Fork" of KeePass. You have to ask yourself: do you prefer and trust individuals from the community producing a free password manager for you to store your personal information or do you head towards a commercial password manager such as 1Password or Password Safe? The choice is yours - some people will prefer to trust their community. What's new in 2.4.1 (see changelog for more)? - Tab order and navigation / UX improvements. Store all of your passwords securely on your computer with this free password manager.